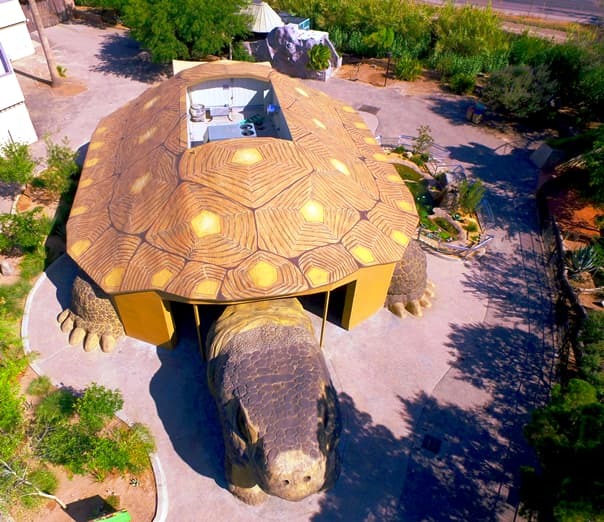 El Paso Zoo, Reptile and Wild Dog Exhibits | Cost of Wisconsin, Inc. COST recently returned to the El Paso Zoo to develop the Wild Dog exhibit and complete the updates to the existing reptile building. The reptile building received new interior habitats that house snakes, tortoises, and lizards. Each indoor exhibit includes decorative enhancements including rock work, earthen textures, small ponds, and faux roots. The exterior of the building also received some creative improvements as a sculpted tortoise head now serves as a focal point and photo opportunity. Concrete tortoise feet were also sculpted at the building’s four corners. We also added decorative simulated rockwork and earth embankments to the building face at the new wild dog exhibit. These finishes provided a more naturalistic backdrop within the exhibit space. COST worked closely with the project team and developed shop drawings, models, and provided on-site construction for theme surfaces and exhibits.